Add 2D as well as 3D text to your scenes and customize them to your liking. Note: 2D fonts keep constantly oriented towards the viewer whereas 3D fonts can be rotated into any fixed orientation, blending into the surroundings according to the perspective of the viewer. 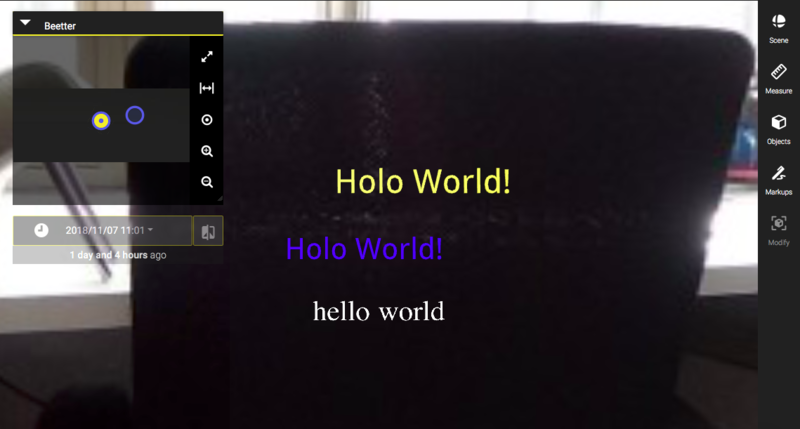 To add a 2D or 3D text to your HoloBuilder project, click the Objects tab in the right-hand sidebar. Open the section ‘Custom Text and Objects ‘ at the top of the right-hand sidebar. Select the dimension of the text layout you want to add by clicking either the ‘A^2D‘ or ‘A^3D‘ button. The 2D text feature offers all the usual settings of plain text implementation and is especially useful to insert short description or similar text segments as well as lists of bullet points and enumerations. Insert line breaks to make long text excerpts lucid through blog formatting. Templates: The 2D text feature offers four different textbox templates which can be used to better layout and highlight the inserted text segments. Chose a layout by clicking on the button ‘TEMPLATE’ in the menu bar of the 2D text editor. Font size: There is no prior setting for a font size – simply move, scale, delete and clone your 2D text using the corresponding tools like with any other 2D or 3D object. Font color: Adjust the color of your 2D text preferably in the 2D text editor. Click on the arrow next to the colored ‘A‘ in the text editor. You will find to color pallets, one for the background and one for the actual text. Please note that if you color your text here in any other color than white, any colors given with the color changing tool as described for 3D text (see below) will only be added on top of that color and result in some kind of mixed color. To be able to use the coloring feature, you need to make your original text white. 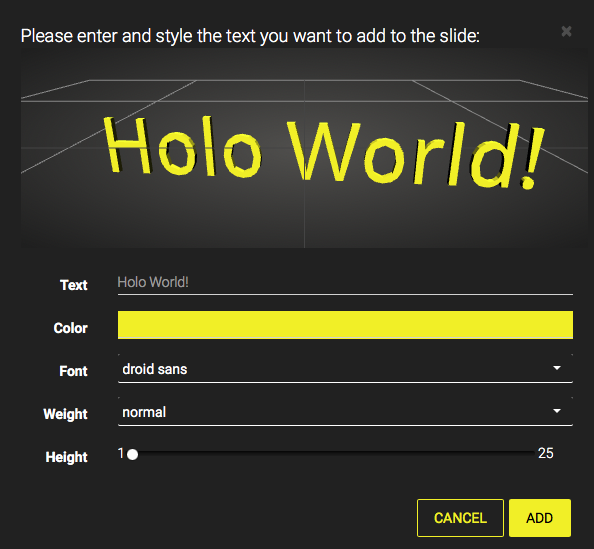 HTML Source code: You can add 2D text comfortably with a simple text editor. Choose your font style and text layout from some pre-defined sets. For advanced customization click on the source code symbol to view the HTML source code of the text. Change your code according to common HTML conditions. Editing: Once you have added your text to the 360° scene you can change the size and color directly in the scene. 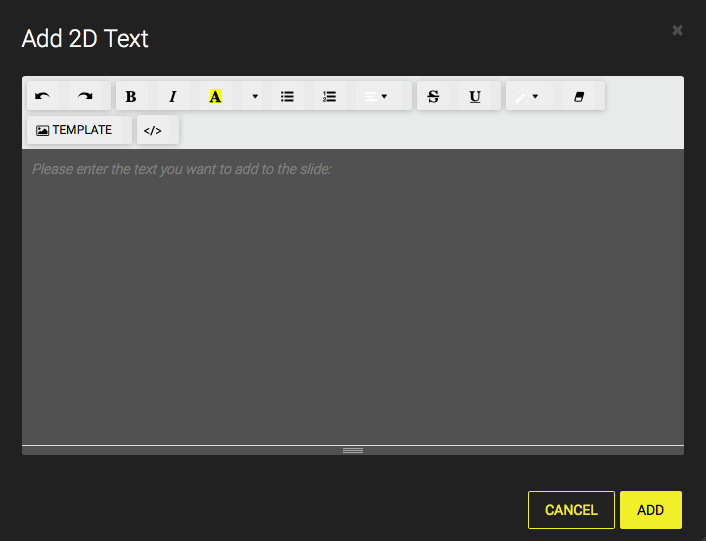 Adjustments for layout and wording can be done by selecting the 2D text and clicking on the button for adding 2D text. Adding 3D text gives you the possibility to adjust the right orientation of the text for a better perspective. Simply enter the text you want to be displayed in 3D and adjust color, font, weight as well as the depth of your text design. Handle your added 3D text the same way as any 3D model: change the location, rotation, and scale, delete or even clone it with the tools displayed in your editing area. Advice: Use 3D text preferably for short text elements since there is no line break possible. Font size: There is no prior setting for a font size – simply move, scale, delete and clone your 3D text using the according tools like with any other 2D or 3D object. Font color: Change the color after adding the 3D text to your project by clicking the object, and selecting the color palette in the sidebar. Alternatively, you can right-click the 3D text you want to adjust the color of and select ‘Change Color’ from the context menu. Beware: Once you have added your text to the 360° scene you can only change the size and color. Adjustments for layout and wording are not possible anymore! You need to delete your current text and start new.